I highly recomend Malcolm Gladwell's book "Outliers: The Story of Success"
I spend a lot of time on planes and trains, and along the way, I enjoy reading when I can’t have my laptop out and work on some projects. 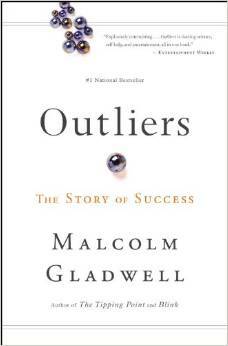 As of late, I’ve been going through Malcolm Gladwell’s “Outliers: The Story of Success”. It completely changed my idea of privilege, succes, and what truly allows people to get ahead in the world. Each chapter covers a different incident, set of individuals, or even a culture, and illustrates the hardships and ultimately the elements that allowed these people to succeed. In one chapter Gladwell illustrates how cultural communcations can create barriers between people, which often put people in precarious situations. It is not that one culture is right or wrong, but simply that they are different. He also highlights the worth ethic of Asian cultures, and contrasts that to America, to point out that stereotypes aren’t always what they seem — they can frequently be truths that are passed down from cultures. In that particular chapter, Gladwell discusses why Asians are so often better at math than Americans. It largely comes down to our American work ethic, in addition to the way spoken English says numbers, versus the way many Asian cultures do. I never would have considered that an individual’s birth month, where their distant relatives came from, or the occupation of their parents would have such a profound effect on a person, but it does. I’d emplore you to read through this book, as I’m confident that it will change your perception of the world as well.